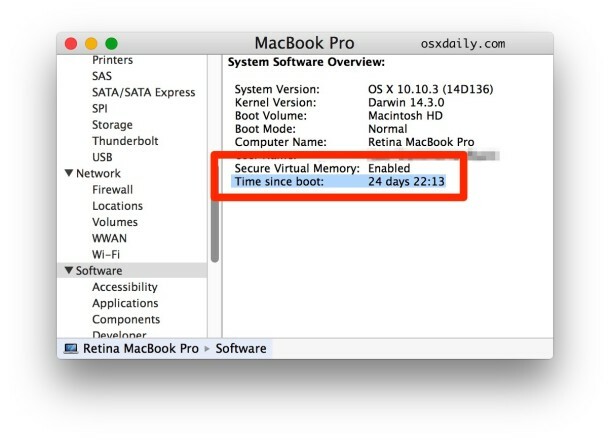 If you’re ever wondering how long your Mac has been turned on and running for, you can discover exactly how long the computer has been on since last boot with two different methods available in OS X.
Let’s learn a bit more about discovering how long a Mac has been left turned on for, and also, theoretically at least, how long you could leave a Mac turned on for. The easiest way to see how long it has been since your Mac was last off or booted is to use System Profiler. As you can see, this Mac has been turned on and running for 10 days and 11 hours and 2 minutes. All Macs will report different data here of course, because some people turn off their Macs at night, and some people don’t (I never do). You can learn more about uptime and getting boot history here, focused on the command line approach, it applies to all versions of OS X and all Mac hardware. How Long Can a Mac Be Left Turned On For? Theoretically, you could leave a Mac turned on all the time, and leave it turned on forever. Yes, it will use power, and yes you should take that into consideration. For me, I personally never turn off my Mac unless I am going to be traveling and not using the Mac for many days, otherwise I just leave it turned on and never turn it off at all. Sure, I reboot to install software and what not, but that’s about it. I put it to sleep if I am taking it somewhere, or want to power it down without a shutdown. I basically never turn off my Mac, and I’ve never had a problem with that. So how long can you really leave a Mac turned on for then? That’s hard to say, if you just let a Mac sit and do nothing for years, eventually some hardware components may fail, but this could take a very long time to happen. In fact, many Mac servers routinely achieve very high uptimes well over a year of being turned on without a reboot or crash, here’s one that is over 400 days for example, and another over 160 days – pretty impressive, right? It is, that’s what you get with stable software on good hardware, it’s yet another beauty of the Mac. hi, well I see 2 users!! but I am the only person to touch my RETINa, why do I see “2users”???? anything to do with my different places, or ….? There is a way to find out when it was shut down and turned on. It comes up with a list of a bunch of times, not just one. why do i see : 11:55, up 19:55, 2 users, bla bla bla ..
You can find out the uptime thru System Profiler -> Software -> Time since boot. Use istat pro widget. It tells gives you uptime and much more. This is a regular Unix command works in Mac and in any other Unix/Linux outthere.